Edit: pretty sure they’re not called arms, but the correct terminology eludes me at the moment(crs I guess). Thanks Thomas. Now I know also the reason for those two longer cross pins. That had me scratching my bald head too. Rick Prentice wrote: Thanks Thomas. Now I know also the reason for those two longer cross pins. That had me scratching my bald head too. 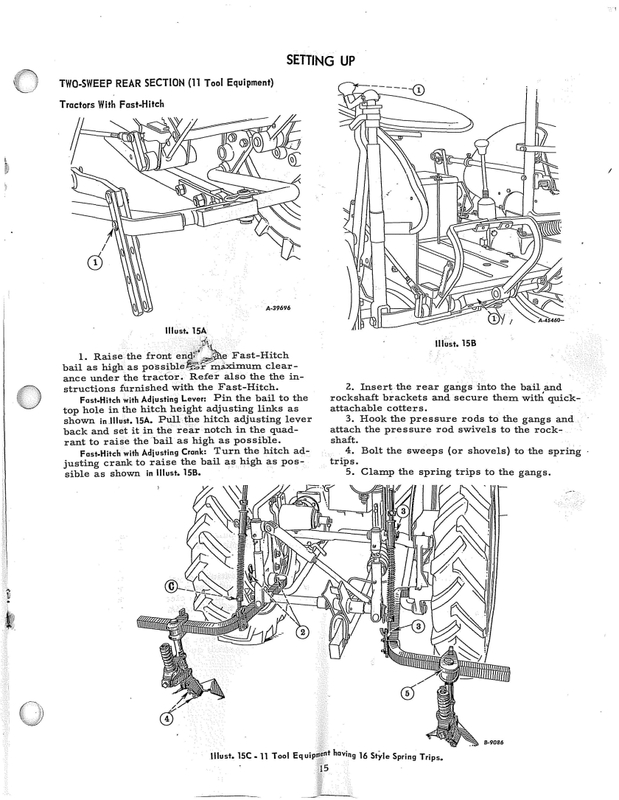 Below is a page from the Cub 144 Cultivator owner's manual showing the rear mounting with a Fast Hitch. They are calling the parts Gangs in the manual. Below is the whole Cub 144 Cultivator owner's manual. It has Fast Hitch, and non Fast Hitch info. It was made in 1965. Hey Rick, glad to see you still playing with the Cubs. Remember, there is no such thing as a stupid question. Rick, Do you want something different than the FH hold up piece? I think that would accomplish what you want to do unless it's too far back. Rick, you could make a piece to hold it that would accept the piece with the series of holes in it that way if you need to adjust it a little here or there for some reason you would still be able to. It is hard to get on and off with that handle and it’s easy to try to use it for a helping hand but could easily break if done so. I’ve found myself adjusting mine several times and haven’t even put a plow on it yet. As age keeps creeping up on me I find that lever, the steering shaft, and one of your steps makes for easy getting on the Cub. Haven't bent/broken the lever yet. Oh, if you do get a FH plow, there is no postive comparison between the lever, as opposed to the crank, depth adjusting levers. Lever wins, hands down. Rick, You could fabricate something that looks like the fasthitch crossmember for a 1000 loader except mount it to the front bolts holes on the finals. It may have to be u-shaped but laying flat like a mid mount blade alternate mount crossmember turned 90*. Good Luck, I know you will come up with something awesome.